A Truro Vineyards wedding is a picture-perfect event. Say I Do in spring, summer, or fall in a classic New England setting, and create an intimate event to remember beneath our beautiful outdoor Pavilion, or in our smaller Barrel Room. Perched between the Atlantic Ocean and Cape Cod Bay along Shore Road, Truro Vineyards of Cape Cod offers a ruggedly beautiful destination for your wedding day. Say your “I do’s” in either spring, summer, or autumn in a classic New England setting, creating an intimate atmosphere. This is the ideal spot to craft a memorable, picture-perfect wedding. The natural beauty of Truro Vineyards has served as the backdrop for some of the Cape’s most stunning weddings -- offering a scenic place to exchange your vows between rows of lush vines and washed in the Outer Cape’s iconic golden light. Dance the night away beneath the shade of the pavilion, which offers dramatic ceilings wrought with exposed wooden beams and airy patios. Enjoy a private tour of the vineyard and winery including a history of the property, explanation of our grape growing process and a little introduction to fermentation and wine making. After the tour, you will enjoy a selection of 5 wines to tasting a sample of local artisan cheese paired with our wines. Take your souvenir glass home with you. A private tour and tasting lasts 1 hour depending on the size of the group: 30 minutes for tour and 30 minutes for tasting. The barrel room is the only indoor venue on the property. Built in 2008, it boasts 30 feet ceilings, wooden beams, hand painted murals and beautiful wooden winery doors. Most importantly, it houses our aging wine in French, American and Hungarian oak barrels. It makes a unique rustic setting for a small ceremony, dining event or corporate meeting, which boasts a warm and welcoming feel that your guests won’t soon forget! Barrel Room capacity is 35 people. 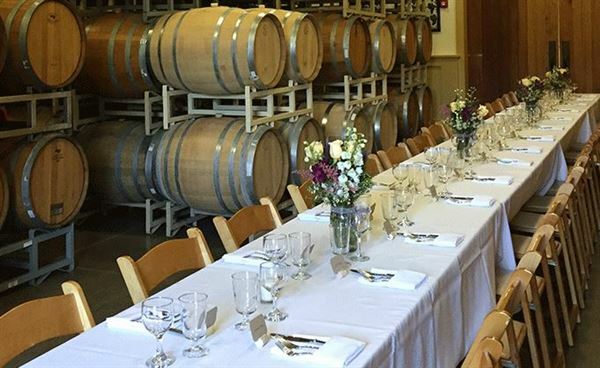 This unique setting is perfect for a rehearsal dinner, small wedding, or corporate event. Please contact us with inquiries. Pavilion capacity is 65 people. It can be a maximum of 85 if two side tents are rented. It can also accommodate 100 people for a cocktail style wedding. Rental fee includes eleven 60 inch round tables, six 30 inch high top tables and a bar for serving our latest vintages. The Pavilion also includes additional seating on our patio, and plenty of room for a classic raw bar. The Lighthouse Inn Offers a breathtaking Cape Cod setting, unlike any other Cape Cod meeting and event location. Secluded on nine acres the Lighthouse Inn has been host to a variety of events including board retreats, corporate meetings, rehearsal dinners, birthday parties, and family reunions for 80 years. The Lighthouse Inn offers 18,000 square feet of indoor and outdoor oceanfront meeting space just steps from the beach. Our convenient location provides easy access to area attractions, island ferries, local arts and culture, golf, fishing, whale watching and local culinary treasures.The Lighthouse Inn is located 90 minutes from Boston’s Logan Airport and Providence’s TF Green Airport and just 7 miles from Hyannis (Barnstable) Airport. The Inn’s versatile meeting space allows flexibility to accommodate your group’s specific needs. Whether a board retreat for 20 or a conference for 225 the Lighthouse Inn offers a unique oceanfront setting. Our 135 foot oceanfront Deck is sure to be the most popular location for breakout brainstorming sessions, morning coffee breaks, and afternoon receptions. Complimentary WI-FI access throughout the property including all meeting space. Take your group on a short trip to experience the charm of Classic Cape Cod, here at the Lighthouse Inn. Old Sea Pines Inn , Main Street, Brewster, the Heart of Cape Cod, invites you to consider the Inn as the site for your wedding, reception, rehearsal dinner, private party or other family/group occasion. Our private 3.6 acres of lawns, gardens and ample parking offers you a very large Classic Cape Cod Inn (14,000 sq ft) with large dining rooms (seating for 130) , spacious meeting rooms as well as 24 rooms and family suites for your guests. The Inn charges Facility Fees for parties, receptions and use of the wedding garden. The Inn's Wedding Garden seats 130 guests , has electricity, lighting and a classic white wedding arbor. Rehearsal Dinners, private dinner celebrations, group dinners, luncheons are produced and served by the Inn Chef and Staff. Wedding Receptions and larger parties are produced by the licensed Caterer you select. Most firms do provide a Wedding Coordinator for the myriad details. If you have selected a caterer that does not provide a wedding coordinator the Inn can refer you to excellent planning service experts. The Inn contracts and provides all licensed liquor service. Please call or email us to check the dates and set a time to visit and inspect the Inn.